Hello! Over the years my travels have taken me from Central Asia to the Balkans, Gaza, Burma, the Central African Republic (CAR) and most recently to Mali. 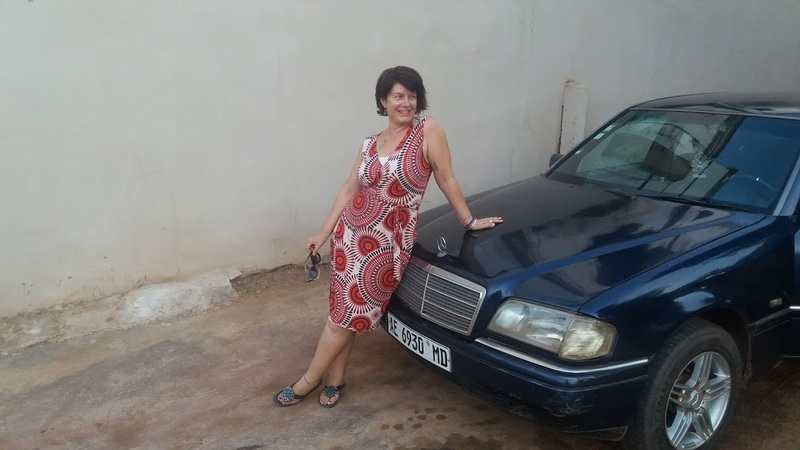 I’ve survived bad times, rocked good times, and written about almost all my journeys along the way (this recent photo is me in Bamako, posing beside my Mercedes, also known as ‘Grandma’ as she’s getting on a bit). Back in the mid-90s I moved to Mongolia, and liked it so much – apart from the horrible food – that I stayed there for three years. I spent my final year living in a remote village in the western Altai Mountains. My first book, Hearing Birds Fly, based on my time in the village, won the inaugural Royal Society of Literature Ondaatje Prize in 2004 for “the book that most evokes the spirit of a particular place”. I used some of the prize money to go on holiday, and the rest paying off my bills and researching my second book, Selling Olga, an investigation into combatting human trafficking across Europe, which was published in 2006. One year later I moved to the Middle East. I spent six months in Ramallah on the Palestinian West Bank, editing an online human rights resource (the Palestine Monitor) then almost 18 months in Gaza City, working for a prominent and dedicated Palestinian human rights organisation. My third book, Meet Me in Gaza, tells stories of ordinary life inside Gaza that you don’t read in the press; beach life, salty jokes, visits to the ancient Hammam, the local lingerie market and the textures of daily life inside the Strip – alongside the turbulent and poignant history of Gaza, one of the oldest continually inhabited cities on earth. After some time back in the UK, I came to the Central African Republic (CAR) in the summer of 2013, spent 6 months based in the sprawling riverside capital, Bangui, and traveled across CAR by motorbike (often with gangs of monks, nuns and NGO workers) investigating the humanitarian situation. Living and traveling in CAR was intense, exhausting and life-affirming; when I finally ran out of money I was forced to return to Tory infested, rain-soaked Blighty, and immediately began to look for a job back in Bangui. A few months later just as my hope was falling flat, I was offered a position with a wonderful, creative peace-building NGO called Concilation Resources as their Central African Republic (CAR) project manager, and returned to Bangui to manage a national peace-building project for two years. I love peace-building because it is not about distributing cash or food, but is about personal, communal and national transformation from the inside. It is in essence the laying of foundations for trust and regeneration on all levels. When my project in CAR came to an end, I decided to take a few months off work: I traveled to Nepal and trekked till I (quite literally) dropped, spent some time in Lebanon re-learning Arabic and some other time over summer volunteering on the Greek isle of Samos in a camp for refugees from, amongst other places, Afghanistan, Iraq and Syria. These are people stranded through the disastrous and dysfunctional EU / Turkey response to this ongoing crisis, and I can’t speak highly enough of Samos Volunteers who are still going strong, entirely run by unpaid volunteers who put many major NGOs to shame. And now I’ve recently landed in Mali, home to wondrous music and other cultural richness, spicy rice, appalling traffic, papayas, watermelons and a political landscape so complex I have to stay for a while just to figure it out for myself! I’m based in Bamako but still travel some, including to Timbuktu where we work with local communities. I write this blog based on my experiences and insights, plus other vignettes that move, outrage or amuse me. I love my life in all its flowing unpredictability and colours and freshness: every day I am to the very best of my abilities, truly alive. So do browse my website, read my blog, and leave a message or comment. Thanks!